A: Anything you like! But I won’t be giving out spoilers. ? Q: Who did the drawings of the characters? They’re great! A: Thank you so much! I wanted original artwork for the series that I could use for graphics, swag, and merchandise. 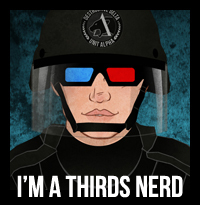 The THIRDS logos, patches, THIRDS Nerds artwork, THIRDS Thursday artwork, and character art are all original designs I created. As well as being an author, I’m also an artist with a background in media and animation. Q: Will you email me to let me know my question’s been answered? A: Since there’s no email requirement to ask questions, you won’t receive an email notifying you your question has been answered, so you’ll have to check back. You will receive notification your question was sent. I try to answer messages ask quickly as possible. Q: On the right-side bar of the THIRDS page on ThirdsHQ website (http://thirdshq.com/thirds/), we have a reference to Primate Therians on Unit Omega. Is this accurate? Because it seems to be the only place were their species are mentioned. If so, will we be hearing from them anytime in the series? I like the idea of Gorilla and Orangutangus Therians ? A: Yes, that’s correct! At the moment since we’ve dealt with mainly Unit Alpha, we get all the Felid and Canid Therians. Once we get further along in the series and other characters from Units Beta and Omega get involved, we’ll see more Bear and Primate Therians. Therians are spread all over the world since the virus went home with many unsuspecting soldiers who fought in the Vietnam War. The THIRDS organization is also spread all over the world. Some branches are smaller and might have a secondary title as well, but it’s part of the THIRDS. So there is a THIRDS branch in Brazil. Q: Loved book 1 and am so excited that book 2 is right around the corner. The dynamic between the entire crew is fantastic. Will Sloane and Dex be the main POV’s throughout the series or will we hear the POV from other characters as well? A: Thank you! I’m so happy to hear you enjoyed Hell & High Water! To answer your question, the first four books are from Dex and Sloane’s POV, where in each book their relationship will grow and face new challenges, both on a personal and professional level. However, there will be new relationships introduced between other characters. Some of those characters will be getting their own stories with their own POVs. The timeline of events will continue chronologically, but the Spin-offs will be Stand-alone stories. The only exceptions will be with Book 5 & 6, where the pairing is different and the each book from a certain pairing’s POV. Since the pairings are already well-established characters and connected to Destructive Delta, the books aren’t necessarily Spin-offs, and will be better enjoyed if you’ve read Books 1-4. That’s me trying to be vague about the pairings, while possibly confusing you. Hope that makes sense. ? You can check out the current number of books planned here. A: Yes! ? Against the Grain, THIRDS Book 5 continues the current THIRDS timeline but it’s from Ash and Cael’s point of views. Same as Catch a Tiger by the Tail, THIRDS Book 6 will continue the timeline, but from Calvin and Hobbs’s point of views and concentrate on their relationship. A: I hope so! There are also other stories planned in the THIRDS world with other couples. I haven’t decided on a definite number, it all depends on how many stories there are to tell with these fellas, if I can keep the series fresh, fun, and exciting. We’ll have to see how the series progresses. ? A: There are definitely going to be other stories with couples from the THIRDS world. One of them being Seb and Hudson. They are on my writing schedule. I’m hoping for two additional stories with Lou & Bradley, and Austen & Zach (who we’ll meet and get more of from Rack & Ruin onward). Q: I was just curious why you are choosing to make book 5&6’s main pairing not be Dex and Sloan and then returning to them in book 7-8. Why not just keep them as the main pairing for the series and make Ash & Cael, Calvin & Hobbs be spinoff stories? A: Dex’s joining Destructive Delta set certain things into motion which effected all the characters and their relationships, including Ash & Cael and Calvin & Hobbs, so their relationships are changing at the same time as Dex & Sloane’s. They’re developing and moving forward much like real life relationships. Due to the overall story arc, it would be difficult to wait 8 books to get their point of views, especially with the way things kicks off for them from book 4 onward. Also, the main THIRDS series is a linear timeline, so from Book 1 which starts in Aug of 2013, by the time we get to Book 5, it’s Nov 2014, so over a year has passed. By the time we get to Book 6, it’s Feb 2015. I know it seems a little odd, but I set up the series to run almost like a TV show with the characters, different things going on with different couples. Characters who aren’t part of Destructive Delta’s main team will still fit into the timeline of events but they’re not part of the original 8 books. So Hudson & Seb, Austen & Zach, and Brad & Lou. Q: How do THIRDS teams get their names? Destructive Delta seems to be the only one with the descriptor coming second. A: The THIRDS team gets their names depending on the classification of agents within the team. For example Zach is part of Alpha Sleuth, a team made up entirely of bear Therians. Sleuth is a collective term for a group of bears. Destructive Delta is made up of only Felid agents. Destruction is also a collective term for a group of big cats. Here in the sidebar you’ll see the names of the teams in Unit Alpha. As you can see, all the teams with mainly big cat Therian agents have ‘Destructive’ in the title. Alpha Pride consists of lion Therian agents with Pride being a collective term for a group of lions. Alpha Ambush tiger Therian agents, as Ambush is also a collective term for a group of tigers. As DD was the first and original THIRDS team, the Greek letter name comes second–putting an emphasis on the collective of Felid agents, unlike all other THIRDS teams where the Greek letter name comes first. The Greek letter names are used mainly for identification. Q: What are the main differences between pre-first gen and first gen therians? A: First Gen Therians were the first generation of Therians to be born with the stabilized version of the mutation. They were born with no health issues related to the mutation, and in general are healthy and strong. Therians such as Sloane Brodie and Ash Keeler are First Gen Therians. First Gens were also the first Therians to provide scientists with conclusive research. Pre First Gen Therians are any Therians born before First Gens. They suffer from a range of health issues which can vary from minor to severe as a result from the unstabalized mutation. Because of this, scientists couldn’t gather any conclusive research to help Therians, as each had a different ailment. Daddy Hobbs, Rafe Hobbs, Sebastian Hobbs, and Sonya Sparks are all Pre First Gen Therians. Anyone born after Sloane and Ash’s generation are just considered Therians, such as Ethan Hobbs and Hudson Colbourn. Q: What year is it during Smoke & Mirrors? Do the years parallel ours? Release date? Date written? Or an entirely different timeline? A: Here is the current timeline that the series follows. Q: Will there be other types of Therians other than the ones previously answered? I’m just thinking of animals like snow leopard, hyenas, kangaroos and such that would be kinda cool. (I just like the idea of a snow leopard Therian that can jump farther than anybody else). A: We do have hyenas and snow leopards in the THIRDS world, we just haven’t come across any snow leopards yet, but they are there. We’ll also be coming across more hyenas, white tigers, primates, and bears. There are no kangaroo Therians unfirtunately. Q: Do you have a specific birthday for all the characters and if so what day and year where they born? Q: Hi, I just wanted to know cause it’s been driving me nuts and I haven’t been able to figure it out from the books how old is Sloane? A: Sloane is 38 years old (in 2014). ? Q: How do you pronounce Cael? Is it like Kyle or Keel or Kale? A: Cael is pronounced like Kale. Q: Do you have a facecast for Gabe? A: I do indeed. Alex Pettyfer (with dark hair) was my original facecast choice for Gabe Pearce. Q: Hello. Love the THIRDS series so far. Just finished Rise & Fall and was wondering if you have plans to give Bautista his HEA? He deserves one too. Thanks! A: Hi! I’m so happy you’re enjoying the THIRDS series. Felipe will certainly be getting his own story and HEA. Q: Will “Against the Grain” be released as an audiobook, like the other THIRDS series? If audiobook is in production, I wonder when it will be released. A: Against the Grain has been released in audiobook and is available from Amazon, Audible, and iTunes. Catch a Tiger by the Tail which was released Feb 5th, 2016 I’m waiting on information from my publisher regarding its contract and production. I’ll be sure to post any release info as soon as I have it. Q: Will “Rack and Ruin” be released as an audiobook? A: Yes. Rack & Ruin in audiobook format is currently in production. I’ll be announcing its release date the moment I have more information. **New info: I’ve been informed that we’re looking at a March/April release schedule for Rack & Ruin on audio. I’ll be sure to post a release date as soon as I have it. Q: Hi so I have a really close friend who is blind and who I introduced to your thirds series via audio books and let me tell you she LOVES them. The only question I have is if you will continue to have your books available as audio books? A: I’m so glad you and your friend are enjoying the series! So far each new book in the series is being contracted and produced as an audiobook after the release of the book. Since the series is based on a linear timeline where each book leads into the other, I would imagine the whole series will be available in audiobook. I don’t have a definite answer, as it all rests on me being able to get all the books written. I certainly hope to get the whole series out there. Q: Do you have a face cast for Rafe, young Cael and young Dex? Also for Ash’s brother Arlo. A: I don’t have a face cast for Rafe, young Cael or Dex yet. Arlo’s face cast is the same as Ash’s (Marco Dapper) since they were identical twin brothers.